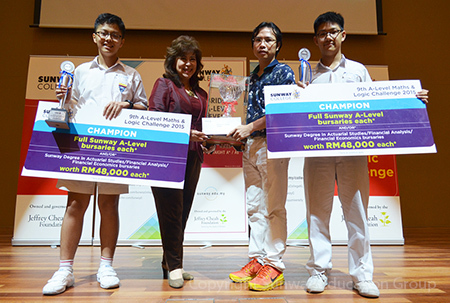 In the recent Cambridge GCE A-Levels Math and Logic Challenge 2015, National Level by Sunway College, 456 participants from secondary schools in the Klang Valley, Selangor, Penang, Perak, Kedah, Johor and Malacca were tested on their ability to think mathematically and laterally. “Math is more than just a textbook question, it can be applied or illustrated with real-world examples. Most importantly mathematics can be fun! This is exactly what we are hoping to achieve here - to make your learning fun. Learning becomes more effective when you are part of it and when you are enjoying it”, said Elizabeth Lee, Senior Executive Director of Sunway Education Group and Sunway University in addressing the participants. Top teams for the State Challenge competed at the National Level, after two rounds of competition, Tan Soon Wei and Takeda Shigenori of Chong Hwa Independent High School, Kuala Lumpur worked their way last Saturday to emerge as Champions of the Sunway College A-Levels Math & Logic National Challenge. They won themselves a full scholarship each to pursue the A-Level Programme at Sunway College or RM48,000 bursary each to study either the BSc (Hons) in Actuarial Studies, BSc (Hons) Financial Analysis or BSc (Hons) Financial Economics at Sunway University, a Certificate of Commendation, an individual trophy each, the Challenge trophy and a cash prize of RM800 for their school. First runner-up winners, Yeap Heng Yii and Hong Jong Yi also of Chong Hwa Independent High School, Kuala Lumpur won themselves a bursary of RM16,000 each to pursue the A-Level Programme at Sunway College or RM36,000 bursary each to study either the BSc (Hons) in Actuarial Studies, BSc (Hons) Financial Analysis or BSc (Hons) Financial Economics at Sunway University and RM600 for their school. The second runner-up team comprised of Theam Wing Chun and Teoh Yen Fu of SMJK Sin Min, Sungai Petani, Kedah won RM12,000 bursary each to pursue the A-Level programme at Sunway College or RM24,000 bursary each to study either the BSc (Hons) in Actuarial Studies, BSc (Hons) Financial Analysis or BSc (Hons) Financial Economics at Sunway University and a cash prize of RM500 for their school. Prizes were also given out to the top 3 teams from the states of Kedah, Penang, Perak, Malacca, Johor and Selangor. Teams from SMJK Sin Min, Sungai Petani, Kedah made a clean sweep for the state. Prizes were also awarded to 20 students who achieved top highest individual scores for the first round of competition. This is the 9th year of the competition organised by Sunway College. The final stage of the competition is the culmination of several preliminary state level competitions in Peninsular Malaysia where top teams for the State Challenge compete at the National Level. Through the competition, Sunway College hopes to be a catalyst in helping to promote excellence in mathematics amongst secondary school students in the country.